Everbe@airmail.cc Ransomware is a malicious program that appends the . [everbe@airmail.cc].everbe extension at the end of its enciphered files and shows ransom notes titled !=How_recovery_files=!.txt. Inside of this note, you should see a unique ID number that the hackers are asking to email to the given email address. We believe the reply email should state the ransom sum and provide detailed instructions on how to transfer it. Also, the message may claim the malware’s developers can guarantee the user will receive all necessary decryption tools, but the truth is there are never any reassurances when dealing with hackers. Consequently, it is not a surprise our specialists advise not to take any chances and refuse to pay the ransom. If you think it is the best option under the given circumstances as well, we encourage you to follow the instructions located at the end of this text and remove Everbe@airmail.cc Ransomware manually. Of course, users who want to know more about the infection first could keep reading the article. At first, we would like to start talking about Everbe@airmail.cc Ransomware by explaining how it might end up on your computer. At the moment of writing it seems the malicious program could be spread through infected email attachments, malicious software installers, fake upgrades, doubtful pop-ups or other advertisements, and so on. In other words, it might be any doubtful file downloaded from untrustworthy sources. Because of this we also advise computer users to be extra cautious with data received from unknown senders or promoted on unreliable web pages. The bad news is in many cases as well as in this particular one it is enough to run the file carrying the malware, and it may begin enciphering all user’s precious data at once. Thus, given rushing could cost all of your personal files, it seems to us it is better to invest a couple of minutes to thoroughly research the suspicious file. Clearly, the easiest way is to scan such a file with a reliable antimalware tool. What happens if Everbe@airmail.cc Ransomware manages to get in? Our researchers say it has only two tasks. One of it is to encipher all private files the user would not like to lose and the second one is to show a ransom note to tell the user what to do to decipher his data. As mentioned in the beginning, the malicious program should name its ransom notes !=How_recovery_files=!.txt. Inside of each of them, you should see a short text saying: “Hi ! If you want restore your files write on email - everbe@airmail.cc In the subject write - id-8c2df1.” The mentioned ID number is unique, so users should see different six character codes in the ransom note texts created by this malware. As you can see, the Everbe@airmail.cc Ransomware’s developers say nothing about paying a ransom. Still, they suggest contacting them is the only way to decipher the infection’s locked files. We are almost one hundred percent sure; the ransom amount would be mentioned in the hacker’s reply if the user contacts them. Another thing we would like you to know is paying it does not guarantee your files will be decrypted. It is possible, Everbe@airmail.cc Ransomware’s creators may not bother to send the promised decryption tools, or they could think of a way to scam you. Under such circumstances, it is advisable not to pay the ransom or even contact the threat’s developers. Since leaving the malware unattended might be unsafe, it would be best to eliminate the malicious program. More experienced users could check the instructions located at the end of this paragraph and learn how to delete Everbe@airmail.cc Ransomware manually. The other way of cleaning the system from it is to install a reliable antimalware tool, perform a full system scan, and press the tool’s provided Removal button to get rid of all identified threats at the same time. Go to the Task Manager. Mark this process and click End Task. Check if you can find the malicious file downloaded before the computer got infected. Right-click the suspicious file and press Delete. 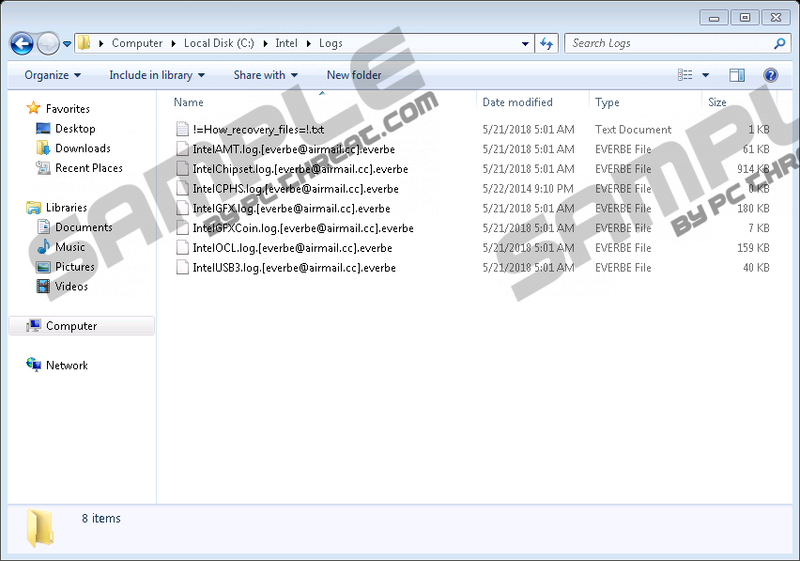 Check folders containing enciphered data and look for !=How_recovery_files=!.txt. Right-click the threats ransom notes one by one and select Delete. Quick & tested solution for Everbe@airmail.cc Ransomware removal.